Gold has halted its minor weakness and jumped slightly after hitting low of $1306 on Friday and global growth concerns and yield curve inversion.US 3 month and 10 year yield has inverted for first time since 2007. It hits intraday high of $1315.80 and is currently trading around $1315.13. Gold was one the best performer in Jan and has jumped more than $50 on account of dovish Fed and global uncertainty. US dollar Index: Bullish. DXY has taken support near trend line and jumped nearly 90 pips .But overall trend is slightly bullish as long as support 95.75.Any close below targets 95.16/95. (negative for gold). USD/JPY: weak. USD/JPY is trading lower for 4th consecutive day and lost more than 100 pips from high of 110.89.It is currently trading around 109.76. The near term support is around 109.55 and any break below targets 109/108.55. Positive for gold. US 10 year yield : US 10 year yield shown a major sell-off of more than 4.5% on Friday and has inverted below 3-month for the first time since 2007.The yield has been trading weak for past two months and lost nearly 25% from high of 3.25%.It is currently trading around 2.443%. positive for Gold. US 2 year yield: It is trading around 2.325%. The spread between US 10 year and 2 year has declined to 12bpbs from 30 basis point. The spread between 5 year and 2- year yield has inverted (US 2 year yield trading above US 5 year yield). 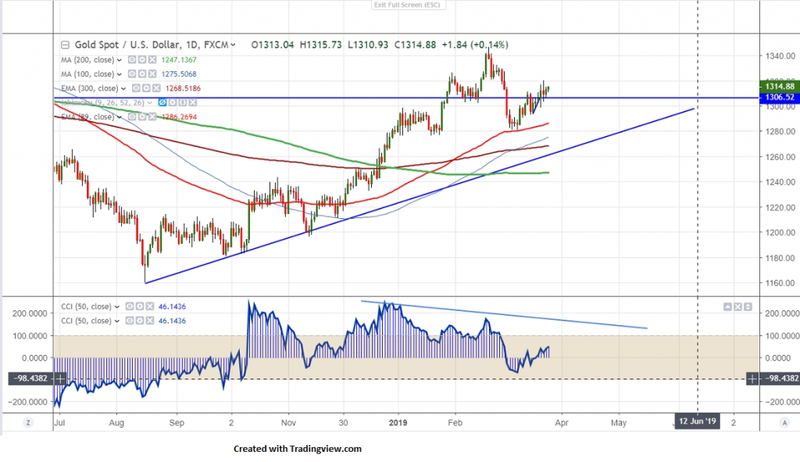 On the higher side, near term resistance is around $1316 and any break above targets $1323 (61.8% fib)/$1330.The yellow metal should break above $1346 for further bullishness.Any break above will take the gold till $1365. The near term support is around $1303 and any violation below will drag the commodity down till $1298/$1292/$1285. It is good to buy on dips around $1309-10 with SL around $1300 for the TP of $1323/$1330.